In Sunday's preseason game (7 p.m.-Cincinnati's Channel 12), the Bengals want to flex their muscles against the big bad Jets, the most physical of the physical offer the trenches' most interesting matchup. 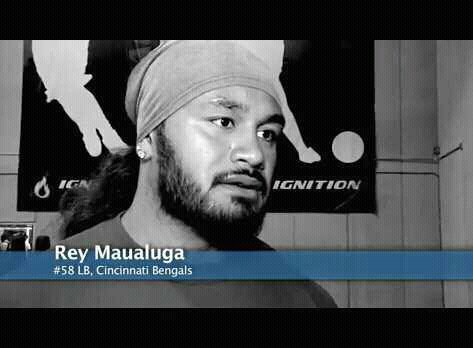 Off what his coaches say is a solid debut at middle linebacker, the Bengals' Rey Maualuga hopes to literally take it to the second level. That's where he'll be pounding heads with one of his workout partners from this offseason, second-year Jets fullback John Conner, the Cincinnati prep product out of Lakota West High School the Jets hope keeps their running game one of the more bruising in the league. "He brings it," Maualuga says. "We knew eventually we'd meet in some game along the way. There was no trash talking, or 'You better watch out.' We're just going to line up and work. He's going to try and block me and I'm going to try and get away from him and get the ball." These two blue-collar guys won't put on a very glitzy show off Broadway Sunday night. It's going to be a lot like the no-nonsense workouts at Ignition Sports in the Cincinnati suburb of Mason, Ohio, which turned out to be a haven for about 30 NFL players locked out during the spring. But there were many days Ignition director Clif Marshall remembers Conner being the only guy in there with 13 and 14 other Bengals. "They're two grinders. They bring the same approach. Hard working. Very humble," Marshall says. "It's going to be something to watch them meet in the hole on that first series." The 5-11, 240-pound Conner often found himself paired with the 6-2, 263-pound Maualuga in their lifting sessions, and Conner had the best seat in the house for Maualuga's monster spring in which he strapped on about an extra eight pounds while setting personal bests in the bench press and dead lift. "He's a real physical guy, great linebacker. We grew pretty close," Conner says. "It wasn't really that weird. We all got along up there. They're all great guys and we're all competitors. We competed and made everybody better." Maualuga thinks the extra time in the weight room derived from the lockout yielded some benefits. His goal was to get a little bigger while not losing his lateral quickness. "I never took into consideration how much work it took to actually get there," he says. "I figured this is my one chance to get better in certain areas and those are the areas I got better, so it sort of helped me." Maualuga knows all about Conner's story. When no offers came out of high school, how he walked on at the University of Kentucky and earned a scholarship before the Jets took him in the fifth round. "Cinderella story, but none of that came easy for him," Maualuga says. "Nothing is ever handed to you and he's living proof of it." But even though Maualuga has taken two years to get to this point after his star-studded college career, he's not looking for any glass slippers. He's simply trying to build off last week's outing in which he got everyone lined with virtually no mental mistakes on a night the Bengals allowed just two yards per rush. "Everyone doubts where we're at and where we're going so all we can control is what we can control and prove them wrong," Maualuga says. "I feel comfortable. Very comfortable. We're looking to play fundamentally sound football and go from there." Conner drew close to his personal bests at Ignition, but he believes no matter the numbers, he got faster and stronger. Now he's on his own after being mentored that rookie season. "Tony Richardson was a big help to me. I learned so much from him and now I'm just trying to get better," Conner says of the long-time NFL fullback. Maualuga also lost his mentor, but he has been keeping in touch with Dhani Jones via the cell phone. And Jones does a dead-on imitation of Maualuga's unique chatter. "Ooh-aay, I'm watching you on film so I can be in the right spot." There's no question that Jones is the biggest fan of Maualuga and linebackers coach Jeff FitzGerald. While he works out waiting for a call from another team, Jones says he understands why the Bengals have turned to Maualuga. "I hear Rey's huge. Two-sixty. That's big and fast. That's dangerous," Jones says. "Rey will do a great job. The MIKE (middle linebacker) is where he should be playing. He just has to stay focused on playing middle linebacker and being able to stay healthy and keep working in the classroom. ... Fitzy is one of the best ... when Rey is on, nobody can stop him." Maualuga's workout partner is going to give it a shot. "I know we'll be grinding out there," Conner says.